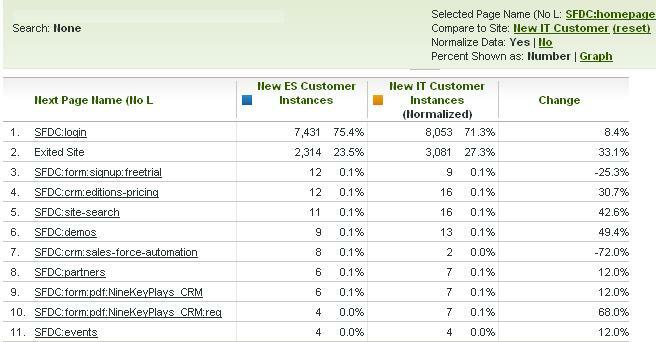 In my last post, I covered Comparison Reports and showed the basics on how to use them. In this post, I will cover a few advanced ways that I use these reports related to Pathing reports. 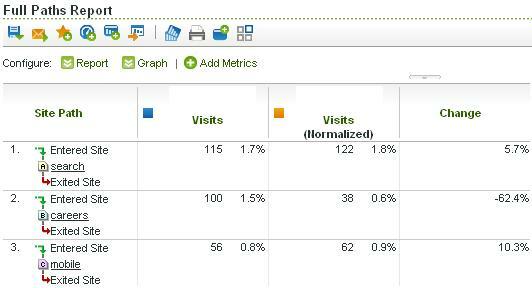 For many of the analyses I perform, I like to see how website visitors are navigating my site via Pathing reports. However, these reports are usually static – for a specified time period. Therefore, what I like to do is to view a few of the standard SiteCatalyst Pathing reports in a way that I can see how Pathing is changing day to day, week to week or month to month. 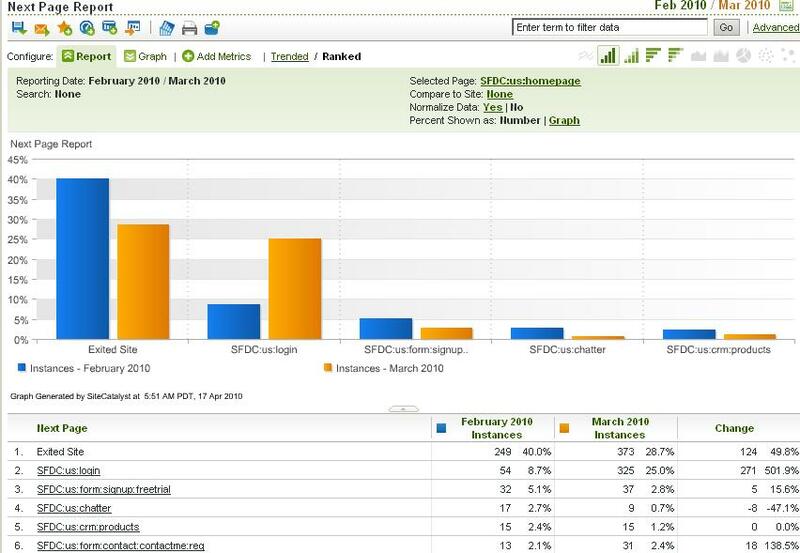 While SiteCatalyst doesn’t let you use comparison reports in all Pathing reports, there are a few key ones that do allow you to compare date ranges – Next/Previous Page Report and Full Paths Report. The following are some examples of how you can take advantage of this. When looking at this type of report, I tend to change the graph so I am looking at percentages instead of the raw numbers since that is what I care about the most. Also, you can apply Normalization to this report by selecting it in the report settings (to learn about Normalization see my previous post). Finally, the same principles apply if you want to see the above report as a Previous Page report to see how people are getting to a specific page differently between two different time periods. As you can see, this report allows you to look at your top paths and see if there are any significant changes you should know about. This is handy if you have a special promotion on a page and want to see how it is changing your Pathing behavior. 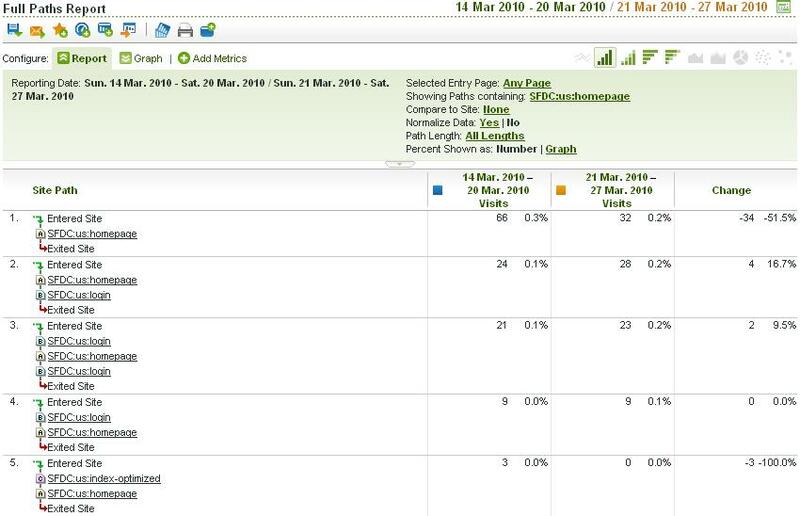 Finally, there are some cool advanced things you can do in the Full Paths report like limiting paths to a specific number of pages and specifying an entry page, but you can explore that as needed. Lastly, if you have Pathing enabled for other custom sProps, you can take advantage of this functionality there as well. 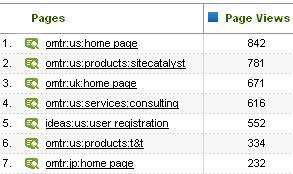 Let’s say you have Pathing enabled on what internal search terms people look for on your website. You can compare this between websites or for two different time periods. Below is an example of looking at the same internal search terms for two different time periods. These two posts should cover pretty much all you need to know about SiteCatalyst comparison reports. If you are using them in any other creative ways, please leave a comment here. Thanks!